Yesterday, I received the August 2007 issue of The Naperville Glancer in the mail and noticed on the cover what appeared to be a photograph of an attractive downtown Naperville building which I had never seen before. I curiously rifled through the pages toward the feature article and discovered a stunningly realistic architectural illustration of the proposed new development planned for the corner of Van Buren and Main Street in downtown Naperville. After I retracted my dropped jaw, the excitement set in as I began to think of how this development will create an exicting new European-influenced layer to the Naperville experience (perhaps a nice French brasserie with indoor and outdoor seating?). Second, make a point to get your hands on this copy of the Glancer as the second generation image I posted above does not come close to the architectural illustration published in this month’s Glancer Exclusive. The first thing you will notice is the classic European influence in the mixed-use buildings which presents what appears to be six distinct architectural styles in the overall development. In my mind, this design will raise development in downtown to a new level and be something which Napervillian’s will take great pride. As for visitors, the unique and aesthetically pleasing elements of the new architecture will be both memorable and buzzworthy. The development, itself, is a public-private venture with Naper Main LLC, which the World of Naperville first discussed in a posting back in May entitled “Naper Main LLC Gets Green Light on the New Downtown Naperville Development Project”. In a recent Naperville Sun article, the term “rave reviews” was used to describe the reaction of the Naperville City Council with one Councilman saying this would be a model for future development in Naperville. Though there have been some concerns, I think it is safe say the development will likely be approved by the City Council very soon. For the rest of the details, I would again encourage you to pick up a copy of the new August issue of The Naperville Glancer to get both the exclusive first look at the new development. While I hope to never be the source of false rumors, for some reason I have heard from a number of different sources this week that Ruth’s Chris is considering bringing it’s steakhouse brand to Naperville. Today, I received my monthly issue of the Naperville Glancer, and the rumors were confirmed within an exclusive story about the exciting new development being planned for the corner of Van Buren and Main Street. While it difficult to contain my excitement for the new development now that we are seeing an architectural illustration for the first time, I will save my enthusiasm for another posting and focus on the downtown restaurant scene. Someone should alert the Exhcange Club that Ribfest may begin to suffer from the year-round “Steakfest” which continues to expand in downtown. While I am a carnivore who loves a big juicy rare ribeye steak and can attest to the quality of Ruth’s Chris product offering, one has to wonder how much of the midwestern marbled meat wonder the downtown restaurant market can support. As it stands, we have Hugos, Sullivans, Catch 35, Teds, Tango and Timpano in a three block radius if you are in the market for high-end beef, with steak-infused derivatives available in all shapes and forms in other downtown restaurants from fajitas to appetizer bites. If we continue to add more restaurants to the downtown scene, I am in hopes that we might be able to land and support a true original. Downtown Chicago has Charlie Trotters as a culinary landmark and destination, why can’t Naperville land it’s own desination restaurant landmark. Don’t get me wrong, I love the restaurants in Downtown Naperville and my family does its share to support their missions, but when 10 West closed I grew concerned that our restaurant scene might end up as a carbon copy of any of a host of Chicago suburbs. When you see the architectural illustration of the new development for the first time, you will see a strong European influence that leads me to think that a high quality French brasserie would be the perfect compliment to the new area. While Bistrot Margot had only a brief run in Naperville, I believe it had more to do with the food quality than Napervillians’ appetite for French cuisine. Mon Ami Gabi or Brasserie Jo would be two good examples from Chicago that I think would play quite well. A high-end Naperville French original would be even better. Another thought, with the popularity of downtown driving commercial rent skyward, we may one day find ourselves in a position where restaurants which serve expensive fare and alcohol may be the only viable business model for downtown. I hope that we never get there and that the growth of unique downtown tenants as well as expanded arts offerings can start to keep better balance with the robust restaurant scene. Even more, let’s please not destroy the presence of unique small businesses in harming the “Naperville experience” that so many other Chicago suburbs are trying hard to replicate today. The ultimate question that I think we should be asking ourselves is “What can you get in downtown Naperville that you can’t get anywhere else?”. As the list gets smaller we will become more and more vulnerable to competing neighborhing communities. I don’t think any of us want that to happen. There are certainly no easy answers and maintaining Naperville’s popularity will continue to be a balancing act. Nonetheless, I have confidence in the leaders and advocates of our community to continue advancing a high degree of creative imagination in building downtown Naperville’s future. Overall, the new Van Buren and Main development project will be a strong example of our community’s cooperation and creativity. I look forward to writing more soon. Ultimately, the “experience” will be the key measure. On Friday evening, as I neared completion of my daily return to Naperville from my job in Des Plaines, I took my usual route west on Ogden Avenue to Washington Street to Spring Avenue for my traffic avoidance short cut through downtown. Though I unfortunately cannot add “work” to the “live” and the “play” aspects of my proud Naperville existence, I take this route to at least pay a quick visit to downtown on my way home each day. On this particular warm hallowed July eve, I turned onto Eagle Street from Spring Avenue and began to notice that not only had traffic congestion found it’s way to my top secret daily shortcut, but slews of families and children wearing crisp white shirts and skinny black ties seemed to be descending in a pilgramage-like manner upon downtown heading toward Jefferson Avenue. Alas, as it was finally my turn to pause at the stop sign postioned at the intersection of Eagle Street and Jefferson Avenue, I glanced briefly to my left and immediately doubled back in awe to see an ocean of Pottermania gaining an impressive stronghold on Jefferson Avenue. I suddenly remebered that Friday night was the big night for The Party that Shall Not Be Named which would celebrate the arrival of the final chapter of the Harry Potter phenomena. Given the fact my two young boys are more fixated on the simpler entry-level read of Farkle McBride rather than the thick volumes of Potter, a visit to the big party was unfortunately not on our evening agenda. Nonetheless, I have nothing but wonderful things to say about the big party and the magical Harry Potter. To me, it’s a thrill to see how excited kids are about reading given the stimulus-rich technological world in which they live. On Saturday, we were invited to another block party within our subdivision and despite a moon jump, an air-enriched human bungee tethered foot race of retractable peril, plenty of indulgent sugary delights and, of course, plenty of bean bags, many of the kids either had their heads stuck in the final Harry Potter installment or were excitedly running around shouting updates on their progress to their friends and family alike. Congratulations to Patti Roberts and the Downtown Naperville Alliance as well as the overall downtown business community for staging a truly magical event to usher in the final volume of the Harry Potter series. While the overall count estimated by those keeping the muggle peace has reached into the 60,000 – 70,000 range, the big success story which seems to have been somewhat overlooked is that of the immediate and longer term economic impact of this worthy family event. A crowd of this size translates into big dollars for downtown merchants and restaurants, which translates into tax dollars for our community. Additionally, the event created yet another prime opportunity to demonstrate to visitors and the outside world alike why Naperville is a magical place in it’s own right. Finally, the media coverage derived from the event as well as the word-of-mouth buzz is priceless. The Party that Shall Not Be Named was as much a celebration of Naperville as it was Harry Potter. Few communities in our population demographic could pull off an event of this scale with not only the enthusiastic attendace but also the vision, creativity and strong support of the local downtown business community. For those who may not know, the Downtown Naperville Alliance (DNA) was created six years ago by downtown property owners and businesses with a simple mission…. promote downtown Naperville. I had the opportunity to go through the Naperville Citizen’s Academy last year with DNA’s Executive Director, Patti Roberts, and it is clear to see the DNA is in good hands. Patti is someone who isn’t afraid to roll up her sleeves and head out into the thick of downtown special events to make sure all of the planning, promotion and investment pays off in generating a high quality Naperville experience. So let’s all join together and bid Harry a longlasting goodbye regardless of the what the final pages may hold and add yet another page to the portfolio of experiences that prove Naperville is a world-class community. If you aspire to become more involved in Naperville or simply keep up with community developments, chances are the name Ray Kinney will surface. Whether reading about him in the Naperville Sun or having a conversation with fellow Napervillians who have said “you should really talk to Ray Kinney”, it became clear very early on that Ray is a well-rounded and respected community leader within Naperville. After the interesting turn of events I recently chronicled while on vacation in South Haven regarding my chance meeting with his sister, Cindy, from Kalamazoo ( World of Naperville on Vacation in South Haven, Michigan) , Ray and I touched base and connected for a cup of coffee downtown at Einstein Bagels last week to talk about our favorite topic, Naperville. As a result of that conversation and hearing more about his long-term passion and committment to Naperville, I talked Ray into being the first to be profiled for the World of Naperville’s Community Leader Series. For those who may not know, Ray Kinney is a long time resident of Naperville and President/owner of Minuteman Press and Maclyn Group. He has been very active as both a member and leader within the Naperville Chamber of Commerce since 1984 and currently sits on a number of boards including the North Central College Board of Trustees, the Naperville Development Partnership and the Naperville Heritage Society. Throughout the years, Ray has received many awards for his strong commitment to Naperville, including Small Business of the Year, Business Man of the Year, Kids Best Friend Award and a Lifetime Achievement Award from the Naperville Jaycees (source: Naperville Chamber of Commerce website). Within minutes of meeting Ray, it’s easy to see his strong passion for Naperville, volunteerism and community involvement shine through. Below is some Q&A stemming from our conversation. SM: What was the original motivation behind your involvement in our community and what continues to motivate you today? Ray Kinney: I was first exposed to the benefits of community service as a student at Naperville Central High School where one of the requirements of a class was to do some volunteer work. I chose to work with clients from Little Friends at the Naperville YMCA, helping to teach them to swim. During that semester, I learned that you can find great satisfaction in giving of your time and talents. After High School and a very short stint at college, I found myself working at the Naperville SUN and living near the train tracks. At the time, the Naperville Chamber was housed in the same building as the SUN in downtown and I went to a few Chamber meetings to meet some people and see what it was all about. Through those encounters, I found an opportunity to get involved with people that cared about Naperville and I became interested in getting more involved. The Exchange Club was just being formed and planning the first Ribfest and I jumped at the chance to help. I met some wonderful people and formed some great contacts and soon volunteering for me became a passion. The Naperville Jaycees provided me with ample opportunities to push myself, learn new things and develop leadership skills – the type of on the job training that is hard to replicate in a classroom. The friendships I formed in my early 20’s while volunteering still guide me today, and many of the people that I met in those early days are my friends, clients and people I know have the interest of others at heart. While it is often difficult to step aside and let new people have an opportunity to be more involved, I have been in awe of what people can do if given the opportunity. I hope my children learn that it is the obligation of everyone to help those around them – both near and far and to give of themselves and their talents to improve the community and the lives of others. SM: What do you think/hope Naperville will look like in 2027? Ray Kinney: My crystal ball is on the fritz, but I do hope that in 2027, Naperville is still considered a great place to live, work and raise a family. The community is much the same as it was in 1979, yet it is quite different – the people are what make Naperville a great place and I would hope that we can say the same thing in the future. Downtown will be larger, that is a given, with the Water Street Development and the expansion to the north will guarantee that while the downtown may look different, my hope is that it doesn’t feel different. I would hope we can find a way to keep the unique blend of independent stores along with the national retailers and the restaurants a success. With North Central College’s Fine Arts Center set to be opened next year, the character of downtown will begin to add the much needed cultural amenities like theatre, music and concerts that will alter the way we use the downtown. A destination center for all kinds of interests and tastes, the future looks bright indeed. Now if we can just find a place to park! SM: What are the biggest challenges facing Naperville in maintaining the vibrancy and present popularity we enjoy? Ray Kinney: It is often said it is easier to get to the top than to stay on top and I believe that to be true in many cases, and Naperville is no different. Increased competition from within our borders and large scale lifestyle centers in surrounding communities all will have an impact on where we choose to spend our time and our dollars. The economic engine that is the Naperville economy, including downtown, needs to stay wary of the developments not only outside of Naperville but internally as well. Issues like traffic congestion, property taxes, public safety, all will affect our region and to stay on top we will need to come together as a community to work on solutions that work for all of us. SM: What is the secret of Naperville’s success? Ray Kinney: I don’t believe Naperville was an accident, nor is there a secret formula to creating a community that is successful. It started with Joe Naper and the early settlers and the type of community they dreamed of being. There are however a few important decisions along the way, that made it work – like making the train tracks run north of our downtown, can you imagine downtown Naperville with an at-grade railroad crossing? The vision of the folks that built Old Main in an effort to bring North Central College to Naperville created an environment that helped put Naperville on the map. But most importantly? The people make this town what it is – past and present, from the early settlers to present day, we have been blessed with residents that understand what community is all about, from Naper to Nichols, from Knoch to Moser, from Fredenhagen to Rubin, to you, this town called Naperville is truly special. The Naperville Spirit is what makes it happen, yesterday, today and hopefully, tomorrow! One guarantee is every time my wife and I go to an art fair or festival we typically head home with a new acquisition in hand. We love to support local artists and one cannot help but admire their passion. This year’s 48th Annual Naperville Art Fair was no exception. After a couple of rounds around the grounds of Naper Settlement, we returned to Grayslake artist Tan Jie’s (tanjie@comcast.net) booth to secure a silk embroidered picture that had caught my wifes eye (pictured above). In college, my wife’s early major was Chineese and after visiting China years ago, her heart is still drawn to the memories of her experience. 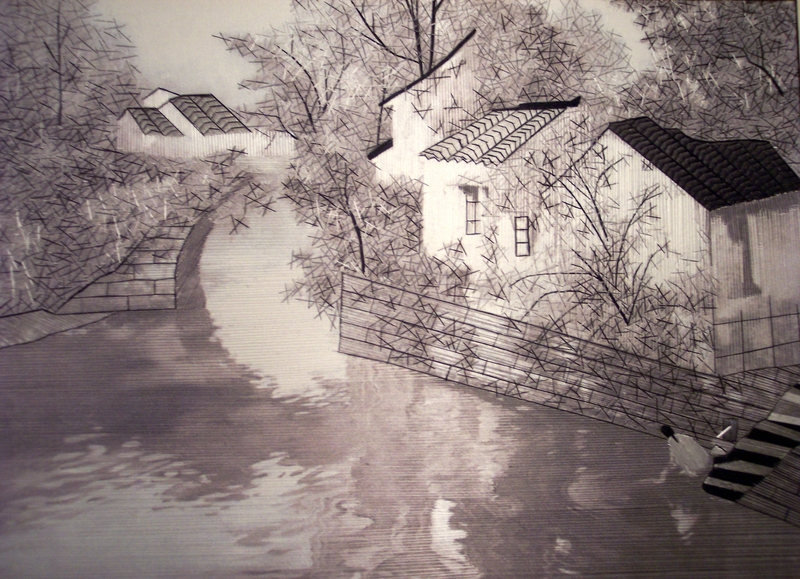 According to our conversation with the artist, the setting for the piece itself is a village named Zhou Zhuang in China. The intracacy of her silk embroidery yields stunning realism in the vivid imagery that emerges before your eyes. In my photo of the piece, note the reflection in the water and then remember it is silk thread. I also admire the subtle perspective that is created as your eyes wander underneath the bridge and on upstream. The photo is not black and white, but the actual color of the piece. For those who may not know, the Naperville Art Fair is the longest running art fair in Naperville history. The Fair is presented by the Naperville Women’s Club and takes place each year at Naper Settlement. For more information, visit their website at http://www.napervillewomansclub.com/. I read in the Naperville Sun today that they raised $8,000 for charity this year. If you missed the Naperville Art Fair, be sure to mark your calender for the Riverwalk Fine Art Fair, September 15-16, 2007. The Riverwalk Fine Art Fair is presented by the Naperville Art League and more information can be found at http://www.napervilleartleague.com/riverwalkfair.htm . By the way, while I love the piece she picked, my wife has assured me that it is my turn to pick out a piece. Doing so will be easy as she will be out of town. See you there! If you follow land development issues within Naperville or any other community these days, you likely hear the term “mixed-use development” quite a bit. More recently, the Naper Main, LLC planned mixed-use development on Van Buren has made it’s way through the Naperville City Council chambers with other projects waiting in the wings to be considered. Mixed-use development is a type of land zoning which combines residential and commercial uses. In other words, it puts people within close vicinity of business and business within close vicinity of people. When you hear many people boasting that living in Chicago is better than being in the suburbs, they are typically referring to the accessibility and vibrancy created by living in neighborhoods which include restaurants, coffee shops, boutiques and other entertainment options within short walking distance. Mixed-use development promotes the essence of community as it brings people and lifestyle closer together in a more intimate way than driving to a strip mall which is seperate from a residential area. In essence, mixed-use development yields the ongoing presence and rythm of life which cannot be achieved sitting behind a windshield on your way to and from a strip mall. Even more, with our nation’s energy consumption being rigorously debated these days, the more we can keep people out of cars and on their feet the better. Could mixed-use development be the ultimate hybrid? Value is created through mixed-use development not only by those who are fortunate enough to live within the mixed-used development area but also those non-residents who experience the living energy of the development. It’s interesting that mixed-use development most likely originated out of necessity relating to restricted mobility, such as the experience of living in densely populated areas. Today, mixed-use development is bringing suburban life back to a central and vibrant focal point. As one can quickly see in Naperville’s land development trends, mixed-use is not exclusive to downtown. Take a look at the English Rows development on Route 59 which combines unique communal architecture with the presence of commercial amenities. We can all be thankful for the vision and creativity of Naperville’s land planners, business community, leaders and developers who refuse to let us grow too distant from one another. The end-result will continue to bring us closer together as a community. The only caveat I would throw out there is my hopes that we will arrive at a day when mixed-use residential developments in Naperville becomes accessible to more than those at the top income bracket. Of course, it comes down to the market-driven economic principles of supply and demand. Nonetheless, I continue to believe that mixed-use development, overall, is good for Naperville.